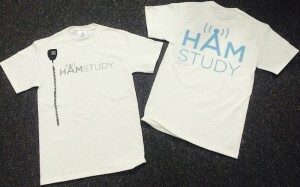 We’re pleased to announce that we now have HamStudy.org t-shirts available for sale! Why get a HamStudy shirt? Every HamStudy shirt you buy donates about $5 to the development of HamStudy. More importantly, the more people wear HamStudy t-shirts (particularly to test sessions and other ham radio events), the more people will know about the awesomeness that is HamStudy! ← Canadian Basic and Advanced question pools added! 6 Responses to "HamStudy.org T-Shirts available!" This is the absolute best flip card online study guide I’ve found on the web. Thanks, Leo! We’re glad it’s useful! Just began study for Technician exam. This is the best study guide/method I have seen anywhere! This is the best way to study. The site makes it fun with flash cards and practice tests. As soon as I get to the point of passing the practice test all of the time, I will be going for my Tech License. I am new to HAM and studying for my Tech level exam. THIS site has been a HUGE help! I have seen my practice test scores continue to improve over time!